After the Civil War, impoverished Texas cattlemen badly needed to get their range cattle to market. The only economical way was to "walk" the herds to a railhead which would ship the cattle to the expanding markets in the north. When the Kansas Pacific Railway built rails to Abilene, Kansas, in 1867, drovers blazed a trail to that small quickly-built cowboy camp and depot. This successful attempt started a cattle driving industry that lasted twenty years and delivered longhorns to slaughter houses in the east, stock cattle to the northern ranges, and beef to the Indian reservations. During this period, various cattle routes were established. The two trails, however, that carried the majority of estimated twelve million head were the Eastern/Chisholm and the Western Cattle Trail.The Eastern/Chisholm (also known as the Chisholm) is well known and documented. The Western is not. The later trail was established in 1874 and carried more cattle, a longer distance, for a longer period than the Chisholm It was the greatest trail of them all. 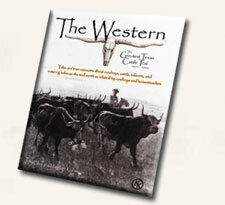 The journey of trailing longhorns over the Western Trail is presented by the authors via a series of hand-drawn maps accompanied by actual eye-witness accounts from cowboys and homesteaders. The tales show the conflicts between the drovers and homesteaders, the Indian encounters during a time when the Indians were being relocated to reservations, and the movement of the trail routes in response to the Kansas quarantine laws. For readers who like to relive the Old West and experience the actual stories of working cowboys and struggling homesteaders, this is a valuable addition to your library. The book includes a 2'x3' map of the Western Trail. This beautifully illustrated map shows the trail section by section as it crosses through Clark, Ford, Ness, Trego, Sheridan, and Decatur Counties in Kansas.